There have been good posts written about creating Elixir libraries already. One awesome recent post can be found here. It will walk you throught the process of writing, documenting and publishing your first Elixir library really well. One thing that was missing for me, however, was a short description on how and why you can wrap your code into reusable OTP application. Let’s fix that. when you run mix deps.get, and compile the project, you can start using UUID module straight away, right from your code. Creating an Elixir library as an OTP application, allows you to do slightly more than code sharing. An application usually starts it’s own supervision tree. It can be stopped manually whenever needed, and started with different set of parameters without affecting the rest of the system. Erlang/Elixir can start multiple OTP applications in one instance of VM. This means OTP applications are loosely coupled, are visible to each other, and processes between different applications can easily communicate (provided they know each other’s PIDs or registered names). When your Elixir project starts, list of applications is provided by application/0 function as shown above. Those applications are started in order provided. You can inspect the list of known and started applications easily using command line, or GUI tools that ship with Erlang. The configuration can be read by the library using Application.get_env/3. Each Elixir project will start several applications, including :logger, :iex, and even :elixir application - those things must be really handy then! We will build a (very trendy recently) chat bot. Our chat bot will be Elixir library, that we can share between our projects, or even publish to hex.pm. 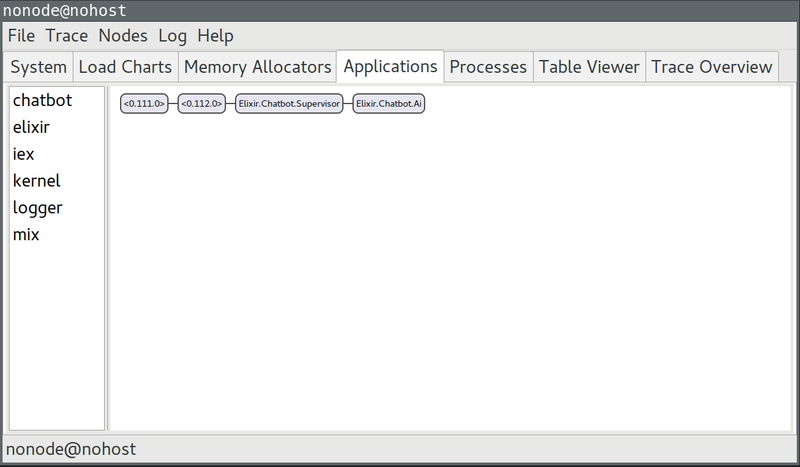 this is scaffold for our application callback module, that by default would start an empty supervision tree. The code above implements simple chat bot as GenServer and starts it when chatbot application starts, under a default supervisor. "Hello, stranger! What's your name?" "Nice to meet you, Hubert. What you've been up to recently?" iex(3)> Chatbot.say "Advanced AI using Elixir"
"This is interesting, Hubert! Tell me more on this..."
OTP applications are a handy way of encapsulating code into logical chunks, such as libraries. If your library needs to perform initialization based on configuration, store state, set up custom supervision tree - this is a way forward.